DEFYING the strong south-westerly wind sweeping across the Irish Sea, Chris Newton (Linda McCartney RT) got to within 32 seconds of Chris Boardman's record for the 37.73mile time trial circuit, opening the Isle of Man week in stunning style with victory in the International Mountain TT. Newton was 47 seconds up on Boardman's 1993 time to the Mountain Box, at the top of the fearsome climb from Ramsey after 23.6 miles, but the gale was cross-to-head all the way back down to Douglas, where he finished in 1-24-26, beating his own 1998 winning time by 2-36. 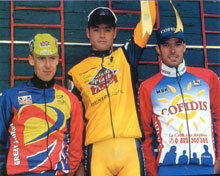 This gave him a clear margin over first-timers David Millar (Cofidis), 1-28-11, and Charly Wegelius (BCFWCPP),1-29-25. Gethin Butler (Team Men's Health), 1-30-52, slipped down one to fourth place, although more than a minute faster than last year, with Paul Esposti (Wales), 1-31-34, claiming fifth place ahead of Gordon McCauley (Team Men's Health), 1-31-38, and Matthew Bottrill (BCFWCPP), whose 1-32-12 beat his best for the course by 12 seconds. All four were slower than Manxman Andrew Roche (Ellan Vannin CC), who won the preceding open event in 1-30-41, while 1997 winner Stuart Dangerfield (BCFWCPP) had a traumatic time. After being sick twice, he climbed off at Ramsey where he was nearly seven minutes down on Newton. The overseas challenge was disappointing, with Germany's Raphael Otto (1-35-15) the best, in 10th place, more than four minutes faster than leading Frenchman Samuel Royer. Oli Beckingsale (1-36-17) was quickest of the BCF-WCPP mountain bike squad, on the island for some hard road training. Non-starters included HarrodsSixt pair Julian Ramsbottom and Chris Ball. After a day of heavy rain, Sunday's weather showed a big improvement with a mixture of sunshine and cloudy skies and only a few light showers to dampen the roads. The strength of the wind at the starting point, the TT Grandstand, was deceptive, and out on the course the conditions were - according to most - reasonable. Newton was flying from the off and, astonishingly, had caught Millar for a minute by the first time check at Ballacraine after just seven and a half miles, going through in 16-26 to his rival's 17-28. McCauley and Esposti shared third place in 17-43, three seconds up on Tim Buckle (Team Men's Health), with Butler a further second down, followed by Wegelius, 17-51. Dangerfield,18-43, was clearly out of sorts and only 13th fastest. 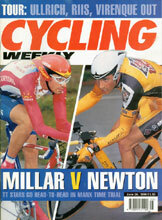 Buckle had disappeared by Ramsey at 23.6 miles, where Newton was timed at 49-01,13 seconds down on his 1998 record, with Millar, 50-01, right on his wheel, and the commissaires keeping a close eye. Butler, 52-05, was now up to third place, ahead of Wegelius, 52-15, Esposti, 52-27, McCauley, 52-54, and Matt Bottrill, 52-58. Millar shot past Newton at the bottom of the climb, but by the Gooseneck his effort was fading, and Newton - riding at a steady tempo - pedalled smoothly away. By the Mountain Box, Newton, 1-07-44, had put another 46 seconds into Millar, 1-09-30, while Wegelius, 1-11-51, had climbed over a minute quicker than Butler (1-12-50). McCauley, 1-13-28, was again clear of Esposti, 1-13-50, only for their positions to alter again on the descent, where the Welsh rider - 20 seconds down on the road at the Mountain Box - got back up to Millar and overtook him. Boardman had covered the 9.1 miles back to the finish in an astonishing 15-23 in 1993, but the wind strength was a lot more fierce this time, and Newton's main priority was to stay upright. "It was so difficult to hold the bike down," said Newton, whose hairiest moment came at the appropriately named Windy Corner, where he was whipped across the road by the angle of the gale. "I thought the wind was going to come underneath the bike and pick me up," he said. "I was really scared. With tri-spokes, I just couldn't hold it. "It wasn't as fast going out as last year, but the climb was a lot quicker. Last year, I was in the 21 sprocket and out of the saddle, while this time I sat down and twiddled. "I rode up really steadily, at level three without killing myself, and just gave it everything over the top. It put me off a little bit when David was just behind me for so long. It was difficult. "I'm going well because I'm fresh at the moment. This one was just to see how I was doing. The BCF championship is my main aim for the week." Millar, recording the sixth-best lap of all time, had no complaints at the outcome. "Chris was flying today," he conceded. "I went hard at the bottom of the climb, and then I realised it was about six kilometres longer than I wanted. I underestimated it. When he came back up to me, I'd had it. The climb was a lot harder than I'd expected. "It's not an easy circuit. I didn't have my bikes over yesterday, so I didn't get to ride round the course and see what it was like. "I hate long time trials, I think I've only done three over 20 kilometres in my life. The championship on Tuesday is the one I'm here for, but my form is absolutely terrible. I was hoping it would have picked up after the Dauphine Libere but it hasn't, so I gambled a bit today and it didn't work. Charly Wegelius, just 21, said, "That was bloke's stuff. The longest time trial I'd ridden before was 35 kilometres, so I was pretty intimidated by the distance. I rode round on Friday, but it's a lot harder when you are racing. "I dealt with the mountain OK - I'd prepared for it. It was the little rolls and bumps that caught me." Dangerfield, bitterly disappointed, went straight back to his hotel. "He was complaining of stomach cramps, and was ill a couple of times before the mountain," said BCF-WCPP team manager Ken Matheson. "He's been doing a lot of road racing but seemed to have the speed, and it's a real blow for him in what is his speciality - he had a point to prove against Chris and Dave." Andrew Roche, second on four occasions, in his attempt to emulate his father Brian, who won the race in 1969, had played safe by entering the open event - the prospectus for the international was by invitation, and he hadn't been invited. He argued his case when the fields were issued, and was offered an upgrade the day before the event, only to decide to stay where he was. Roche was fastest all the way round, reaching Ballacraine in 17-15 to lead ex-pro Rob Holden (Manx RC) by seven seconds, with course newcomer Leon Wright (Sigma Sport RT) third in 18-07. By Ramsey, Roche, 52-01, was clear, with Wright, 54-37, moving above Holden, 55-11, and the gaps grew on the climb. Roche went past the Mountain Box in 1-12-20 and Wright, 1-16-01, was now over a minute up on Holden, 1-17-03. But while the leader increased his advantage on the descent, Wright came down so cautiously that he conceded second place to Holden by 14 seconds, giving the local residents a one-two. "If you've got the strength you will do a good ride today," said Roche, anticipating what was to come in the second event. Roche, who will be riding for the Isle of Man with Holden in the forthcoming Island Games, added, "I'm happy with my ride. I'm not as quick as I have been in the past, but I didn't expect to be. I'm working now, and I haven't got the same time to train." Wright took the David Mulcahy Trophy for the fastest newcomer. "I lost time coming down the mountain," he said. "It was so windy that it was frightening, but I'm safe and sound!" With Paul Dotchin, 1-35-48, leading its challenge in fourth place, the RAF CC retained the team title ahead of Manx. Ellan Vannin CC, with Roche backed up by Richard Fletcher (1-39-58), missed out when their expected third man Gordon Kennaugh, a farmer, was unable to complete his milking duties by his 6.47am start time. Liam Maybank (Twickenham CC), who was ruled out last year when he omitted to ride through the Governor's Bridge dip, took fifth spot in 1-36-30, ahead of Wessex Division road race champion Duncan Urquhart (Army CU), 1-36-41. Team.- RAF CC (Paul Dotchin, Keith Jackson 1-40-56, Steven Wilcox 1-41-39) 4-58-23. Veterans.- Dave Hargreaves (North Lancs RC) 1-44-02. Women.- Susan Smith (Coventry CC) 2-12-32. Trikes.- Brian Moore (Solway SCC) 2-04-36. H’cap.- Paul Dotchin (12-00) 1-23-48. 20. Tony Mayer 1-30-32 (1983).